This is the outside shot of Serenity. 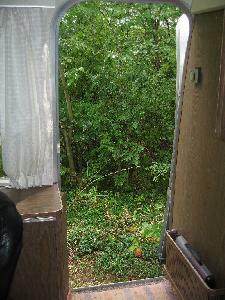 This is the same physical space, now set up as my mobile office inside the airstream. From my office chair, I can lean back and grab a cold bottle of water or a snack from the ‘fridge. I have my own kitchen area (I don’t even have to leave Serenity to enjoy lunch when I work) and I have a bathroom and a couch. Not bad digs for an office, eh? This is the view out my office door. And the door is to the immediate right of my desk, so I can lean back and gaze outside whenever I want. Heck, it’s even bright enough in here with the skylights and the banks of windows that I’m managing to keep plants alive! I have an office that can FINALLY keep a few plants from turning all brown. I have alot more left to do. I’ll be tricking it out for technology for future trips, so I can work wherever I go. But for now, I’m loving it with every step toward the ultimate goal of complete portability. 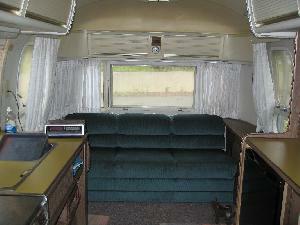 3 Responses to "My Airstream Mobile Office is All Set Up Now"
You did a great job turning it into a home office. Clean, spacious, and inspirational. I’m at the beginning of re-habbing my 1959 Airstream 18′ Globetrotter, and am always checking out projects others have done, and selecting the best from what’s out there. Thanks for posting! Thanks for visiting WickedBlog. If you are going to blog your process and progress, let me know. I’d love to see it and read it and would be happy to give you a link back. Best wishes!